MTC has made it easier for you to ride — and connect — throughout the Bay Area by implementing a Hub Signage Program in many of our busiest transit locations. Well-traveled hubs like the Ferry Building, and BART and Muni stations, now have standardized signs and displays to get you the information you need to catch that next ride. 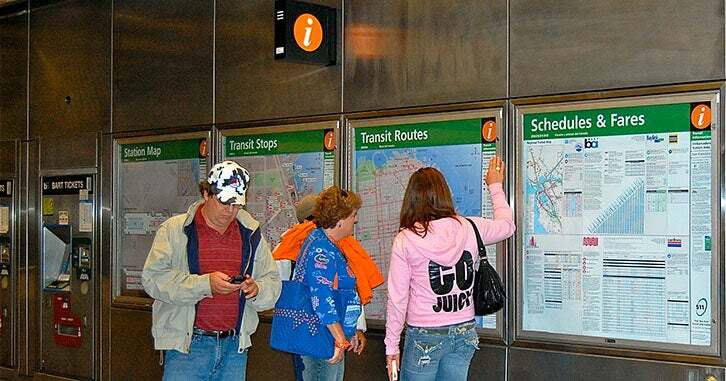 By including signs, information displays and real-time departure displays, we’ve made transit trips as seamless as possible for Bay Area residents and visitors alike. MTC partnered with BART, Muni, VTA and other transit agencies to install signs that provide directions at the entrances and exits of transit hubs. Responsibility for the operation, maintenance and replacement of signs is split between MTC and its partner transit agencies. Look for the big orange circle with the “i” for information at downtown San Francisco BART/Muni stations. You’ll find street maps, schedules and transfer info, along with a live screen with real-time info on when your bus or train is coming. A unique feature of the Hub Signage Program is the retro “flap sign” in San Francisco’s historic Ferry Building. Webcam of flap sign: Check out our live picture. A busy and centrally located transit hub and retail center, the Ferry Building serves approximately 11,000 visitors and travelers daily.